Palm Pictures released Jeremy Marre’s groundbreaking documentary of Bob Marley Rebel Music June 26, 2001 on DVD and VHS. The film had previously aired on the Public Broadcasting System’s “American Masters” series in the U.S. on February 6, 2001, and in a shorter version on Channel 4 in London in the summer of 2000. The following interview with Marre explores some of the differences between the two versions, in particular the BBC’s demand for a “British” voice as narrator, as opposed to the Caribbean narrator Marre used in North America. For those who want to know more about the human Bob and the political and cultural currents in which he swam, this is the film to have. I would hesitate to call it the “best” film on Bob: Time Will Tell is a classic portrait of Bob from a more mythological, iconic perspective. But I was impressed with Marre’s attention to Marley as a multi-centered human being. The sources of his poetic inspiration, as well as some of his human weaknesses, are revealed through previously unreleased footage, and through exclusive interviews with numerous individuals who knew Bob intimately, and who had not previously talked about Bob on film, such as former Miss World Cindy Breakspeare, arguably the greatest love of Bob’s life, and Esther Anderson. The revelations about Bob’s attitudes towards and relations with women are alone worth the price of admission. They will be controversial to some of Bob’s fans, but this is certainly a topic about which we will hear much more. One of my few disagreements with Marre concerns the conflicts Bob experienced as a youth as a result of being “brown,” or of mixed “race.” Marre argues that he encountered prejudice only from light-skinned Jamaicans, while Rita Marley and numerous other witnesses make it very clear that Bob sometimes faced severe prejudice from “black” Jamaicans as a result of being the son of a “white” man. Perhaps Marre’s position is a reflection of the all-too-common “white liberal guilt complex.” Many who want to be on the “right side” of the struggle for equal rights and justice are compelled (by largely unconscious forces), to understand the issue of racism in black-and-white terms. 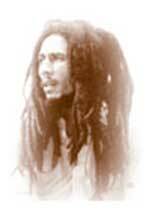 But Bob’s life dramatically illustrated the truth that racialism is a problem perpetuated by people of all colors, which is of course why Bob and most of the Rastas made the concept of “One Blood“ a cornerstone of their philosophy. Otherwise, Rebel Music greatly advances our understanding of Bob Marley in his times, with the emphasis as much on the times that produced the man and the artist, as on the artist. The following interview took place in September 2000, when I was in London to speak on Marley at the Jamaica Blue Café, and to do an interview on BBC. The text is based on a slightly edited minidisk interview of 60 minutes, which can be heard by clicking here. 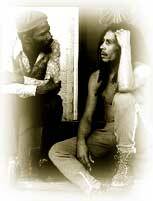 Some of the best stories Marre told me (for instance, about Rita Marley’s mercenary tendencies) were off the record! But I think you’ll agree that the stories he did tell about the trials and tribulations of making this film are lively indeed. Gregory Stephens: I’m here in Jeremy Marre’s house in Camden Town, in Greater London. Jeremy’s wonderful documentary “Rebel Music” showed on Channel 4 here in London on August 5th, 2000 and [aired] on the Public Broadcasting System’s American Masters series in North America in February, 2001. Which is kind of funny…. GS: What led up to the making of this documentary? JM: Well, in 1977 I was in Jamaica and I made a film called, “Roots Rock Reggae,” which came about because I made a film called “British Reggae,” about musicians and workers who’d left Jamaica in the fifties and come to live in England. It had people like Roy Shirley, a lot of the old-timers and also the British bands in it. JM: Exactly, right. And so I wanted to go to Jamaica and find out where the music came from and I couldn’t raise any money because British Television was completely uninterested in reggae music. GS: This was in the seventies? JM: This was in 1977. GS: The year of Bob’s releasing “Exodus” and blowing up all over England. JM: It’s incredible, isn’t it? JM: So I went up there and I made “Roots Rock Reggae.” We made it in two and a half weeks; it was very fast. It was a moment in time, really, looking at music in the month that we were there. And we came across some incredible musicians and some incredible music. It was very turbulent; there was a lot of violence on the streets and a lot of that was reflected in the music. GS: I think I’ve heard this song before…. JM: Yes, I was to hear it many times, subsequently! And, I didn’t know what to do, basically. It was the first real film that I had taken a risk on. We showed it to the BBC and the BBC said, it’s so boring.’ Reggae music is so boring, it all sounds the same.’ So, Bob Marley sounded to them like Ethiopian Chant which sounded to them like Jimmy Cliff which sounded to them like… it was absurd to say that it was all the same! So we had no sale and we couldn’t show the film anywhere. And then I wrote to Chris Blackwell and I said, ‘we’re in a real mess, you’ve got to help us out with Don Taylor.’ And then I got a call saying someone’s coming around to look at your film at five o’clock. So I said ok and we sat up a projector and [in] walked Bob Marley. He sat down with three or four people, and they watched the film and they danced, and afterwards he just shook me by the hand and left. GS: Didn’t say a word? JM: He didn’t say a word, just shook my hand and left. The next day I got a phone call saying there are no problems. [laughs] Don Taylor has with drawn his injunction! It’s fine to go ahead. JM: Their film and they were going to show it. They then showed it at nine o’clock in the evening as the BBC award-winning film; my name was omitted in all the publicity. I then completed a long series on world music called, “Beats of the Heart,” where we traveled to many different countries looking at the relationship of music to politics, to peoples’ aspirations. Then I was making a series called Classic Albums, and I’d done one with Paul Simon on Graceland which was interesting because that went full-circle. It turned out that a film that had sent Paul Simon to South Africa to find Ladysmith Black Mambazo, was one of the films I’d made for Beats of the Heart. In fact, the film directly after Roots, Rock, Reggae, which was Rhythms of Resistance! GS: A microcosm of post-colonialism. JM: Yep. With Cuba and Castro on the one hand, with the American pressures on the other, with the British colonial heritage…and all this incredible culture coming out of it. And I thought, well there’s an interesting theme. Chris Blackwell called and I mentioned this idea to Chris and he said well, it’s a possibility, why don’t you write to the Marley family.’ I thought, well the Marley family turned almost everything down that they haven’t proposed. They also were going to do a feature film at that time about Bob’s life, with Lauryn Hill playing Rita Marley. So I sent it to [the family] and they said, in principle, yes. So, that was a good start, and we had to raise quite a lot of money; and we went to British television who said, we don’t want anything to do with this’. And we tried American television, and PBS showed more interest than anybody. I think they thought it was time to put a major artist on who was not American, in the American Masters slot. They’d only done Pavarotti, I believe, before as a non-American. They got behind it, and we got some French television interest, and then we just chugged away at Channel four, which used to be a very progressive and innovative channel. Eventually they said yes, a completely different department from the one that said no. GS: Can you tell me a bit more about the genesis and development of this idea of Bob as a child of his times? Because the timing was certainly serendipitous with all the honors that have been heaped upon Bob’s head: “One Love” as BBC’s Song of the Millennium, named by the BBC; and Time Magazine, naming Exodus as its Album of the Century. So your timing was perfect to get a broader perspective on Bob’s life beyond just Bob the Artist,’ which strikes me as what is new, in some ways, about your documentary. JM: Yeah, the timing was good, but that was fortuitous of course, we couldn’t know. But really, the people we were approaching in terms of funding had no knowledge of any of these things. They live in another kind of media world, and it’s blinkered to some extend. And I did notice that when we got to Jamaica to do the research trip, there was such a focus on Bob’s achievements you mentioned, Album of the Century; but I don’t think anyone here was even aware of that, really. See, people don’t really read Time Magazine in the UK. In the end, we didn’t shoot until Jan-Feb. 2000, and [there were] a lot of delays. There was a lot of research to be done. A huge amount of reading, a huge amount of listening, a lot of talking to people, and getting the money together proved incredibly difficult. GS: We were talking earlier about some of the fights you got over this, which struck me as appropriate in some way, if you look at Bob’s life and the amount of fight he had to go through to get his music out to an international public. Some of the fights were just getting rights to footage, and that type of thing. JM: It was very difficult. There were certain tensions, also, between Chris Blackwell (who owns the publishing for Bob), Island Universal (who owns a lot of the footage and the records) and the family (who owns Bob’s appearance). Without any one of those three, you couldn’t proceed. But the three of them were not always on the best of terms, and we were in the middle. And there were some quite aggressive lawyers in between as well. It sort of began to spiral out of control from time to time. Apart from getting the money together, there was getting the concept right, from my point of view. Because it needed to be different, and it needed to have focus. And the focus was really, in the broader sense a political one. It was the politics of Bob’s life. The politics of his songs, the politics of the music business, the politics of being a Jamaican in that Colonial and post-colonial era, the pressures on the island, and the ways that those followed him all through his life, right to the end. It is, to some extent, an extension of what I was doing in Roots Rock Reggae. But I was also trying to reveal, quite intimately, what made Bob tick as a human being, against that [political] backdrop. What I wanted was a big emotional close-up of the man from those who knew him best, set against the broader political backdrop of this island tossed in the currents of the Cold War. So the next difficulty was to find people in Jamaica who had not participated in other films, and get them to talk openly and honestly about their relationship with Bob; and that was terribly difficult. JM: It’s a bit like asking a gumshoe or a private eye how did you find someone?’ Actually the process of persuading them, was the process of finding them’; getting their telephone numbers, finding them time and time again, faxing them, speaking to them, going over there, knocking on their door. GS: How did you find the footage of Esther Anderson with Bob, when he was around twenty-seven? JM: I had found that footage during the shooting of the Classic Albums film in Toronto. I had that brought over to England by a stewardess on American Airlines, because it was on these early, crumbly and quite inflammable tapes, which no one was willing to transport. She brought them in a shopping basket on the plane for us. We then had to bake them, which was quite a dangerous process, because all the tape was falling apart; and it had to be baked solid, and we then transferred it onto tape. GS: And a stewardess literally carried it, so you’re doing international contraband to tell Bob’s story! JM: [laughing] That’s right! So I had, physically, the material, but I did not have the copyright on it, because obviously I didn’t own it. So we traced that back to the guy who shot it, Lee Jaffe. He played harmonica on Natty Dread, “Roadblock” and he toured with Bob in the states in ’75, I think. There is actually some footage of that which we didn’t use in our film because the sound quality was very bad. But there’s a whole show that’s been filmed by a guy in NY, and it’s amazingly good footage. GS: There are stories about Don Taylor standing in front of Lee to hide his whiteness.’ Is that actually true, do you know? GS: …they were sort of following the mythological narrative? JM: Exactly right, and that’s what they wish to perpetuate. So that didn’t work out. But I did, in the end, persuade Bunny Wailer. My God, it was hard work; and Bunny’s a difficult man, but he gave a great interview in the end. Then Cindy Breakespeare was willing to take part, Esther Anderson gave her first ever interview [about Bob] and quite a few other people, Coxsone Dodd among them, the Great Coxsone Dodd! He was difficult. We chased him and we faxed him and we talked to him…and then he was in NY when I was JA and then he was in JA when I was in NY…then I met him, and I talked to him, and he said, no.’ Under no circumstances would he give an interview, because he was planning his own life story. And I said, well it could only be good publicity, and we only want to do two minutes. Well, if you only want to do two minutes, then there’s no point in doing it. So there was no way to persuade him. Then, when I was actually there for the shoot, I went to see him again; and he didn’t want to see me and I hung around the gate. But Carl Bradshaw was incredibly helpful. And we waylayed him on one occasion, and we talked to him, we went in and hung around; and finally he agreed to do it. He did an interview which lasted, I suppose, an hour. We just used a little in the program, because in the early days we had to move through quite quickly. The main problem in the early days was that, while you could write a fascinating book about it or make a fascinating radio program, because the stories are fantastic, there’s no footage. So we were really limited in what we could do. GS: I was wondering if, speaking of Bunny and Coxsone and people like that, you could make any generalizations about the reasons for which people have had a lot of reluctance to talk about their story? JM: I think the reasons are very many in Jamaica. The people feel they’ve been ripped off a lot, not simply by people from outside or people with white skin, but everybody. They don’t want to be ripped off again; they’ve been ripped off by their own people worse than by outsiders on occasion. I think they have the misconception, in Jamaica, that any program being made about Marley is being made with Hollywood-style budgets. Many times I’ve had people say to me, I want a million dollars,’ because that’s the fee that Clint Eastwood would expect. The perception of documentary films is very distorted. You know, we make them fast and on quite small budgets, and that’s not comprehended. Some people feel they’re giving away something that is, ultimately, incredibly valuable and that will keep them in their old age. Everybody in Jamaica is writing a book, everybody in Jamaica is about to make a film of their lives…every single body! Prince Buster through to Coxsone Dodd through to Bunny, everybody. GS: They are giving you something very valuable, but they don’t have an accurate sense of what it’s really worth. Is that fear that their words will be distorted widespread? GS: Although a contested hero…if you follow the debate about Bob as a national hero. Can you tell me how you came to interview Cindy Breakspeare? JM: Roger Steffens put me in touch with Cindy. I told her what I was doing and she said that, if the program was an intelligent and sensible look at Bob’s life and her part in it, then she would be happy to take part. JM: She’s a wonderful person. She was so accommodating, so articulate, so helpful; really. When I asked her later for some pictures of her and Bob, they were put in the post immediately. She was really kind and generous. I was nervous about that interview, because I knew that the film would not work without certain elements: it needed Bunny, with his memories; it needed Cindy; and it needed Rita. And there was a problem. A big problem, because I had been led to understand that Rita would not want other women in the film. When I finally caught up with her, she was very difficult. She didn’t want to be in the program. GS: I’ve heard this song before, too! JM: It was not because of the other women, she didn’t know about the other women, it was to do with the overall deal and the role the Marley family were going to play in the program, and how Bob was being depicted, and everything under the sun. We did hang around for two or three days, and we wasted a lot of time. Rita never appeared. So we left and I went to film Mrs. Booker, that wasn’t a very positive experience either; because she was surrounded by some fairly antagonistic people. So I came back and I didn’t have a decent interview with Mrs. Booker, although I was able to use a little bit of it, and I had no interview with Rita. Then there was an imbalance in the editing. Because Cindy was brilliantly articulate, striking, and her memories were great. Esther Anderson was pretty good, too, strong. But there was no Rita Marley. So we didn’t know what to do. Eventually Rita said, I’m going to do it if you’ll come up and film me on Monday, and that was on Friday night. And I said, where are you, Rita; well I’m in Jamaica. [laughing] And I said, well, can’t you wait?’ and she said, no, I’m going to Brazil on Tuesday.’ So I flew up there with a little mini handheld TV camera because I had to take it past customs, I’d no visa. So I flew in there like tourist, met up with a cameraman friend of mine who flew in as a tourist from America, and Rita was there, thank God, and she did a really good interview. And, out of the blue, she suddenly started talking about her feelings toward Cindy and the other women. GS: Like not wanting to sing background on “Turn Your Lights Down Low,” for instance? JM: Well, yes, and all kinds of stuff which she’d never talked about before. And, in a way ultimately, Rita kind of holds the program together because Rita is one of those continuing people. She’s there at the beginning, all the way through to the end; she’s a thread throughout the program. GS: Let me follow up with two questions. One is to get you to comment on why you felt those three figures, Cindy, Rita and Bunny, are so central in telling the human side of Bob as a part of these political currents of his time. And, second, why you feel that there is so much negativity around many people who were close to Bob that you tried to interview. JM: Well, in the first case, Bunny because he’s the last surviving Wailer. He grew up with Bob as a child, Bunny knew Bob better than anybody in the early days, and Bunny could tell us things that other people really couldn’t say, about his childhood about the young Bob. Cindy because Cindy was a major force in Bob’s life. Channel four had very much wanted her to be a part of the program. GS: Is that partly because of the press that was aroused over their relationship? JM: Yes, entirely. But Cindy, I knew, would have a lot of intimate input. And I knew that I could get the story of what Bob was going through when he was in England when he’d had to leave after the attempted assassination, which is part of the political story; why he went back to Jamaica. GS: The piece of her interview about him saying that he’s gonna have to be militant, because [of] the accusations of going soft’ was really priceless. JM: Uh-huh; and let me tell you, for every sentence that’s in the program, there are two dozen that aren’t in the program that are equally good. It was a real struggle to decide what to use of Cindy’s [interview] it could have been the Cindy Breakespeare Show. And then Rita, well, because Rita was his wife; and because Rita was the person who was there from age 17 through to the day he died (on and off). JM: Those three people are the people who really hold the program together. GS: I agree. And about the degree of negativity that one encounters, and the fight over control…all the infighting that goes on to this day…. JM: Money. [long pause] Power and Money. Mostly money. That’s all. GS: Do you feel that the money has caused people close to Bob to lose sight of Bob as political and a spiritual figure, on the level that people around the world tend to think of him? GS: …this is Orlando you’re referring to? JM: Yeah…nor must there be anything that relates to drugs; [then] you’ve reinvented the man, so that you’ve taken just about everything that was meaningful to him away. And I think this reinventing people by corporations, which we see happening so much today, is a bit frightening. Because what they’re basically doing, is they’re reducing these people to commodities. GS: What have you learned about Bob as a human being and as a sort of a mythological figure through the process of doing this work? JM: At the beginning I had one major problem over all the practical problems that I’ve been talking to you about. And that was that I didn’t understand Bob as a human being. And it’s very difficult to make a feature-length program, about a man you don’t understand. Because if you don’t understand him, then who the hell’s going to understand him? Even in Catch A Fire, I thought well who is this guy?’ Who is this guy who makes this incredible music? He’s so obtuse, he’s deliberately uncommunicative in so many situations …where does he get the poetry from? How did his music really evolve, and he evolve as a person? What were his racial attitudes really -about black and white? I don’t understand this man. GS: You learned a lot about him, I’m sure. JM: I learned a lot about him as I was making [the film]. Something I mentioned to you earlier, when we were going through a lot of problems in the cutting room, things always sorted themselves out. And we developed a confidence there in the making of the film. And whether they were contractual problems, or editorial problems, or creative problems we just said, Bob’s on our side,’ and things always panned out. Or if there was a real problem in cutting a sequence, it always sorted itself out for us. And I think that, to some extent in the post-production process, watching Bob, listening to him, listening to what people had to say about him…I began to understand him much better. GS: So where do you think his poetry came from? The amazing power of his vision. GS: Right, it’s a living culture. JM: Yeah, so I think there’s that element. There’s the Biblical element; and the Proverbs, which I’ve encountered in many different societies. For example, I made a film about proverbs in Madagascar, where the literal is not as important as the proverbial, where you suggest all kinds of things. All this is part of the richness of your language and heritage, and I think Bob was able to use that and incorporate that. Tie to that the independence and political awareness that was coming through, and he must have been a highly intelligent person. He went into the Rastafarian camps and he listened. He listened to the wisdom and he listened to the readings. He may not have said a whole lot, but he was listening and absorbing. And I think, to some extent his songwriting was a collective thing. GS: His vision was deeply personal and yet entirely collective, at the same time. JM: Yes, yes. There was input from all the people around him. And as Esther Anderson says, you know they read the newspapers and listened to the radio; they read the Bible. And out of that they created their own wisdom. It’s a kind of a prophetic role that he played. GS: The Rastas have been described as a community of prophets. Which I think is very true. JM: Yes, yes. And then, of course, he listened to a lot of music. He listened to a lot of American music; he was influenced, to some extent, by American politics. So he was absorbing all of that and it was a very creative and a very turbulent period. JM: Some dirty laundry. But we get a taste of all that from Phillip Agee. I think that’s another element, it does put Bob Marley in an historical context and a political context; which, I think, also helps people who perhaps didn’t appreciate certain aspects of his music, or found him hard to understand. GS: As someone who has long worked in areas that are about the intersection of politics and music, can you speak in your own voice about what you think is significant about this story, beyond the politics of Jamaica or of Bob Marley’s life? JM: Well, one of the significant factors is the role of a third world society at the mercy of pressures of great powers. Originally the British Colonials, then America takes over and there’s the struggle with Russia, there’s Jamaica’s move towards Cuba; Jamaica this little island– trying to find a home somewhere, and actually being used as a political football and being totally exploited. How bauxite is taken: bought for nothing, sold then from another Caribbean island which is a tax haven at hundreds of times the price to the rest of the world so people are profiting enormously and at the same time Jamaica is getting nothing. That’s been the story of Jamaica to a large extent: the way the island has been exploited. But what also fascinated me was the story of a kid who was the result of a one-night-stand between a soldier and a peasant girl, who was brought up with no opportunities (apparently), in the slum district of Jamaica, and through his own doing, his own focus, his own vision, through his own ambitions, became what he did become: a prophet for the developing world. And a poet, and a musician. So it was both on the broad political level and on the individual level that it became a fascinating story, really. GS: Regarding the colonial mentality in Jamaica against which Marley struggled, you told me some fascinating stories earlier about where that mindset is carried forward to the present, in terms of the way in which black and white voices were used in the film. JM: When we chose the narrator, I wanted to use the same style as I have used in other films I’ve made abroad; and that is that the narrator’s voice should not be an outside’ voice, but should be from the community. There are several reasons for that: there’s the integrity of the program, there’s the [concern] that an outside voice isn’t making some kind of value judgement from a different time and place, all sorts of things. We’re not standing back and writing it too much from the perspective of today (looking at yesterday), but much more out of things that Bob said, things that people have said about him. So we wanted to use a Caribbean voice, but British Television wanted a British voice. We had a bit of a struggle that went on for some time. That was to give it a specific British identity as a program. And we fought that one, and we lost. We lost insofar as when it was transmitted in Britain it had a British voice, albeit one that, finally, we weren’t too unhappy with, but for the rest of the world and for the US, too, it will have a Caribbean voice on it…..That was the only thing that, ultimately, was imposed upon us. GS: You’ve worked with this material for a number of years. Can you say something about how you relate to Bob Marley? Has that evolved over time? Does he speak to you in a personal way? JM: Yeah, I think there’s a lot in Bob that speaks to everybody. [Because] there’s a great deal of wisdom there; and I think there’s also an anger there, which I think I can relate to as well. On the other hand, as a filmmaker, you do (to some extent) have to sit outside it a little bit and tell a story that people are going to understand. Not become too involved or over-sympathetic to the subject, or one thing would fight another. I mean, there were moments that I was slightly uncomfortable with, perhaps, when I first came to tackle them. Was Bob manipulated by the politicians, for example, in the One Love Peace Concert? Why did he allow that to happen? Did he want to re-establish his role as the number one in Jamaica? Did he know he was being manipulated? And I had to tackle those subjects. Maybe if I’d been too sympathetic to Bob, I’d have said, well I can’t say something like he was a pawn of the politicians, but, in a way he was for a period of time. They were using him, and I think you have to be honest about that. I think one has to confront that Bob was also a victim from time to time. Cindy talks about that, too; about recognizing evil and the power evil has over you. And I think you can see some of that coming back at him at the end of his life, too. So there are aspects of the story where I think one has to be objective and say, however much I sympathize and identify with this man, still, I’ve got to stand outside it and look at actually who he was, what his impact was more objectively. GS: I went through the same struggle myself, as a writer, trying to maintain objectivity and still having a part of me as a private person, that is really moved by Bob, in some very private ways. The song, “Ambush in the Night” has gotten me through a lot of hard times. Are there pieces of Bob’s music that have really spoken to you directly? JM: I kept saying we’ve gotta get “Ambush in the Night” in this film, and we never got it in; there was so much we couldn’t fit in. What really infuriated me was that Channel Four the idiots at channel four’s PR Department, put out a press sheet saying this is the definitive Bob Marley film.’ And then everybody turned out saying, how can this be the definitive Bob Marley Film?’ It isn’t the definitive Bob Marley film, it’s one perspective. And I’ve got 74, 86, 90 minutes (whichever version you look at) to try and tell this in. You can’t begin to make a definitive story. It’s one particular perspective on one aspect of his life. So it’s in no way intended to be definitive. There are a dozen other films on Bob Marley to be made. GS: Well, I would like to thank you very much for taking time out of your very busy schedule to talk with me; and maximum respect for your works. Jeremy Marre is a London-based filmmaker. Among the highlights of his many documentaries have been “Roots, Rock, Reggae;” “Rhythms of Resistance”; the “Beats of the Heart” series; and “The Making of Paul Simon’s Graceland” and “The Making of Bob Marley’s Catch a Fire” for the “Classic Albums” series.